I am gluten in tolerant and am needing to know if this product is gluten free. The package does not state if it’s gluten free. Please reply to my email with your reply. We cannot label this product “Gluten Free” due to the possibilities of cross contamination. The product doesn’t have wheat in the ingredients but there is a small possibility of cross contamination because of a hushpuppy mix that is packed in the same facility that has flour in it. Is Alabama King fine, stone ground corn meal available in any grocery store in St. Petersburg, FL? You should be able to find it at Publix, Walmart and Winn Dixie. Also, there are 2 independent stores that carry the 1.5lb Alabama King along with a variety of other Dixie Lily products! Are there any stores in Atlanta, that carry Alabama King cornmeal? Yes you can find the Alabama King corn meal at Publix. If its not in your local Publix ask the store manager and he can get it for you. Thank you. Where can I get Alabama King in the Huntsville, AL area? My local Publix cannot order and I do not have a Winn Dixie near me. Please let us know if you need anything else. Thanks for requesting our products! I just bought some at the Twickingham Publix. This stuff is great. How about Anchorage, AK? Are there any stores that carry Alabama King? Thank you so much for contacting us. Unfortunately, we do not have any grocery stores that carry our products in Anchorage, AK. However, you can always order our products on line at https://southerntraditionalfoods.com/. We appreciate your business and we hope this helps. Thank you so much for contacting us. 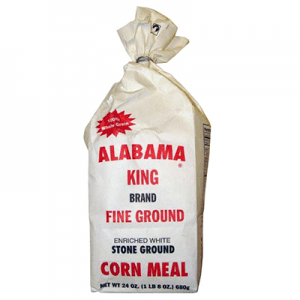 Alabama King Fine Stone Ground Corn Meal is not bolted. It is whole grain. We hope this helps and we appreciate your business. Where to find near west Houston, TX? Thank you so much for contacting us. Unfortunately, we do not have any grocery stores in your area that carry our products. You can order Alabama King or any of our other products online at https://southerntraditionalfoods.com. We appreciate your business and we hope this helps. Thank you so much for contacting us. Unfortunately we do not have any grocery distribution in Rochester NY. However, you can always buy our products online at https://southerntraditionalfoods.com/. We hope this helps and we appreciate your business. Thank you so much for contacting us. You can find Alabama King at your local BI-LO or Publix. We appreciate your business and hope this helps. I LOVE this cornmeal! I especially love that the cornbread recipe on the package is made with only the AK cornmeal. Most cornbread recipes include all purpose flour. I don’t avoid gluten, but I prefer whole grain baked goods because they have more nutrition than baked goods made with refined flour. This is the best cornmeal I have ever used and it has changed my world in a wonderful way. Just what I was dreaming of! Thank you! I’m in West Virginia, Charleston area, can you tell me if any stores in West Virginia, Virginia or North Carolina carry your Alabama King Corn Meal? Thank you so much for contacting us. Please try your local Publix or BILO for Alabama King. If you don’t see it on the shelf then please ask the store manager to carry it. If all else fails you can always purchase it online at https://southerntraditionalfoods.com. We hope this helps and we appreciate your business.